The bar of maps and layers of management tools. The tree layers of the current map. 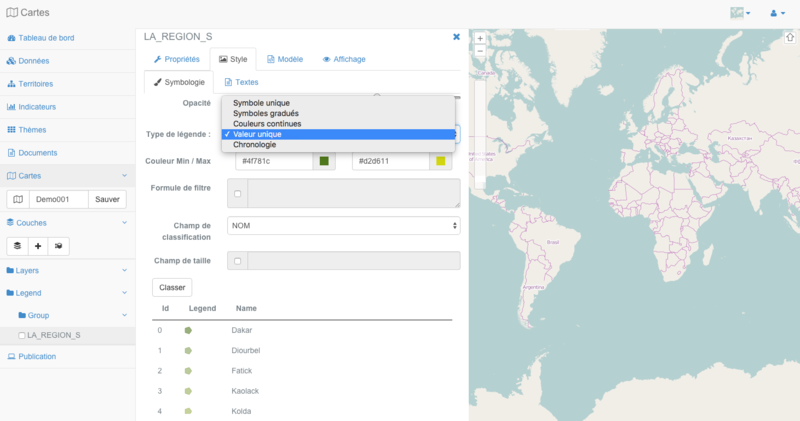 A context menu is available in the upper right of the map, to the left of the usual authentication button. It lets you choose the base map to use. 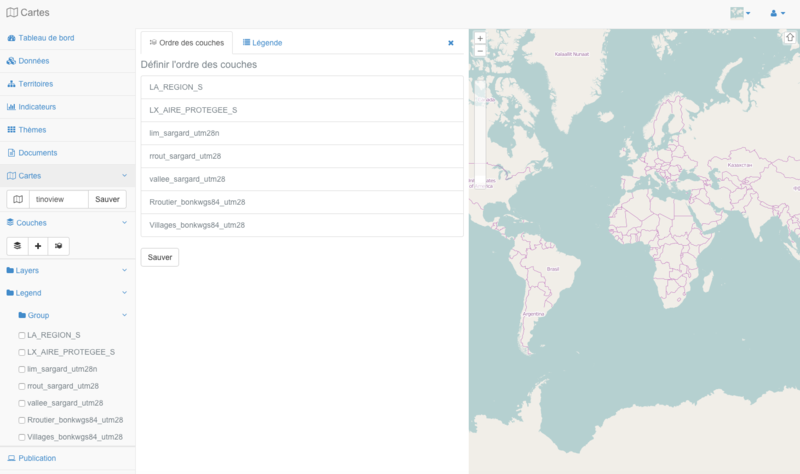 By default, when you load your funds OpenStreetMap map creation module are displayed. You can either use MapQuest Map and Satelite or using a colored uniform background. 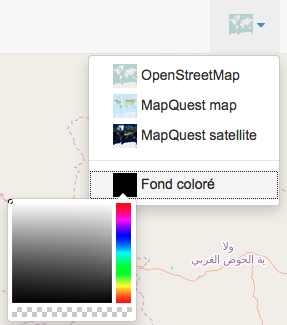 In the latter case, you need to click on the colored square in the context menu to bring up the color selection tool, then select a color to display the map on this background color. To open an existing map, click on the corresponding icon on the left of the map being edited. This causes the display of the map just opening menu below. 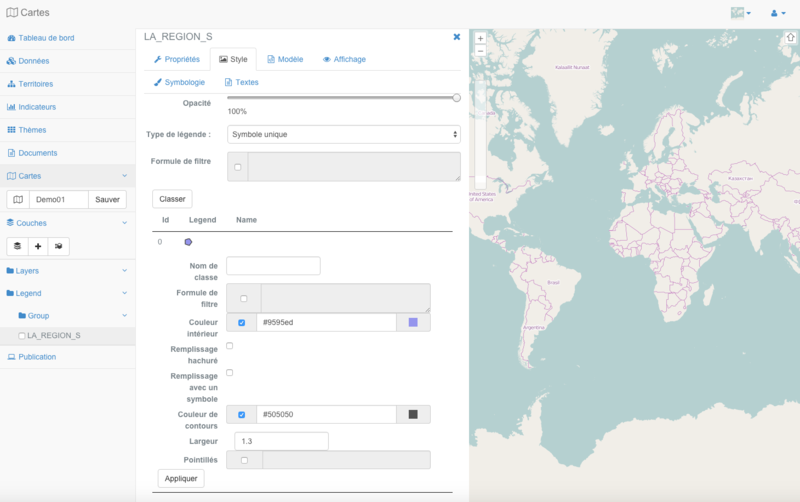 Select a project by entering its name in the text field provided for this purpose, selected the name of the map to open in the list and click the “Load” button. The opening of the card triggers the refresh map creation module and loading the requested map. To save the current map with a new name, change the name of the card in the text field provided for this purpose, then click the “Save” button. In making a right click on the first node of the tree ( “Layers”) layers, a context menu with the tools listed below appear. To add a new layer to the shaft and to the map, click on the “Add layer”, which will display the corresponding form as shown below. 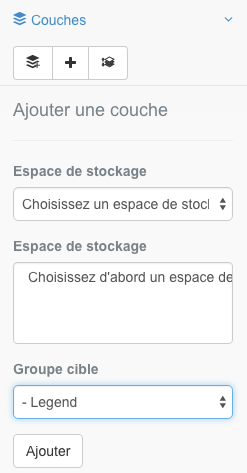 First select a storage space in the first drop-down. This refresh the second list showing sources of data contained in the selected storage. Then select one or more data sources, the group layer where you want it(s) appear(s) and click the “Add” button. 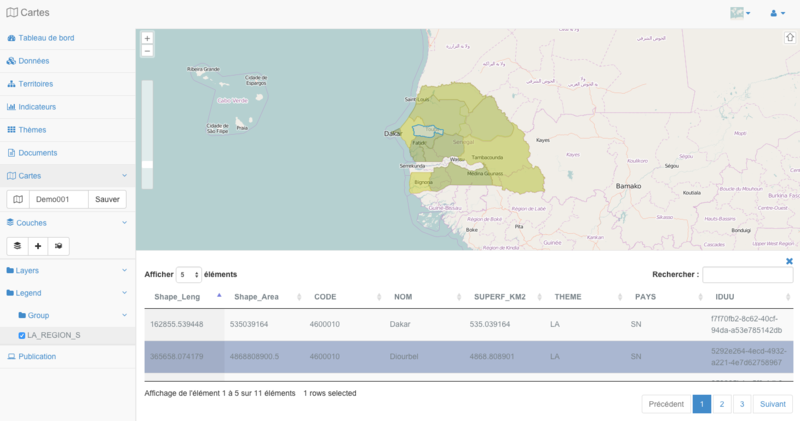 This causes the disappearance form, module refresh and the addition of the layer to the map. Hold down the “Ctrl” on your keyboard to select multiple data sources. 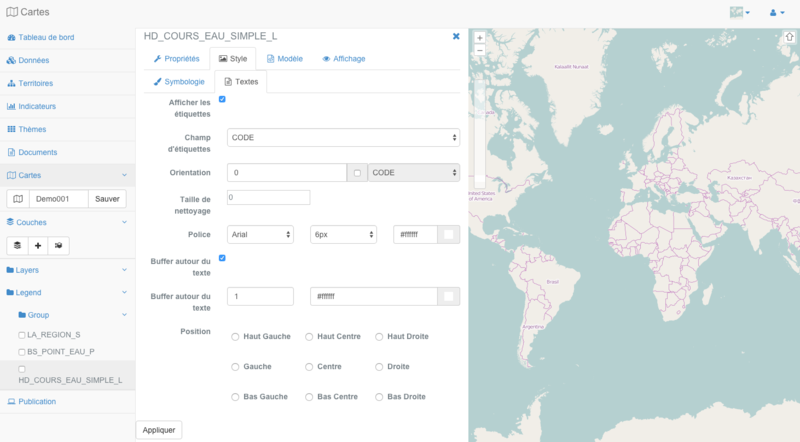 To add a grid map (graticule), click the button “Add a grid,” which will display the corresponding form as shown below. 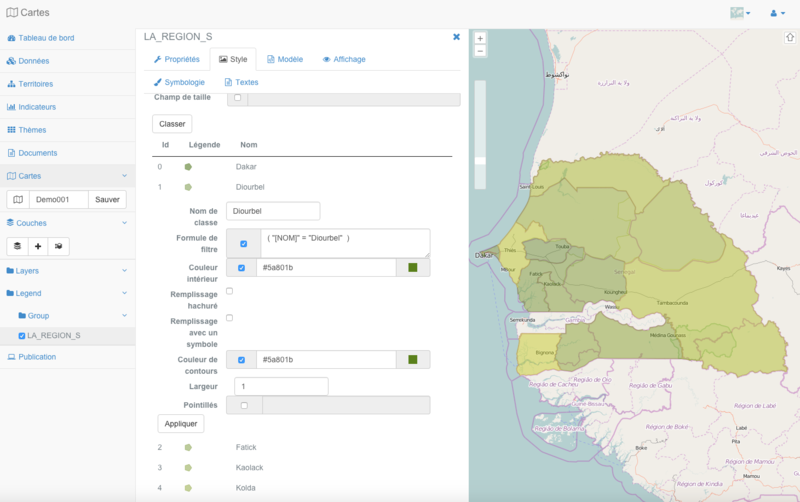 Specify a name for the grid and click the “Add” button, which causes the form are gone and the addition of the grid at the root of the tree layers. Please see the section on setting panel layers to parameter the style of the grid. Once created, the grid has the same settings tool than the other layers, accessible by right-clicking the shortcut and a layer menu. To manage the order of the layers on the map, click on the “Manage the order of layers,” which will open the corresponding panel as shown below. The panel has two tabs, the first in the list of layers present on the card are listed in order of opening. You can then move a layer by holding your mouse cursor pressed on the layer name and then operating a drag to the desired spot. Then click the “Save” button, which causes the actual change in the order of layers. The last layer is added to the map above all others. The uppermost layer in the list of ordered layers of the panel and the lowest when the superposition layers for display on the map. In the second tab, you can manage the map legend. 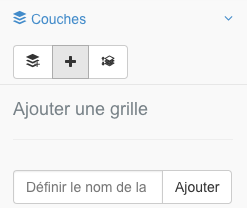 You can, in the same way as before re-order the layers within a group, re-order the group or add a group as presented in the section. It should be noted here that the order within a group or sequence of groups them has no effect on the display order of layers. This is only the display of the tree and not the order of the layers that is attached to it in the first tab. To create a new group layer, right click on the first node of the tree and then click “Add Directory” which will open the corresponding window. Specify a name for the group layer. The group name is used in the legend of the published map. You can edit the name using its context menu. When you click on a layer with the right mouse button you see the menu appear then a layer. To zoom in on the geographic extent of a layer, right click on the layer name and click on “Zoom”. This results in refocusing map the extent of the layer in the document pane to the right card. 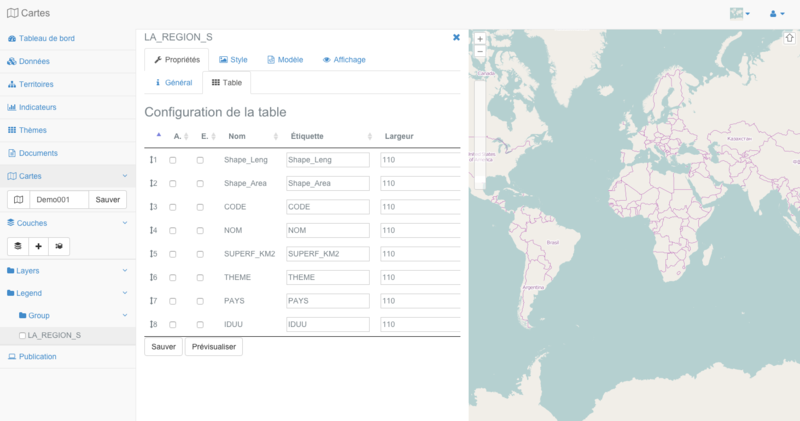 When you click on a table row, this geographical unit is highlighted on the map. This is the mom of the default layer (equivalent to the name of the data source). Changing this value is optional and does not affect the layer name in the published map. It changes the name of the layer in the mapfile only. This is the layer name as it will appear in the legend of the published map. Enter a string describing succinctly layer. Enter words describing the layer. These must be separated by commas. Enter a string describing the source of the data used by the layer. This may be the name of the organization that creates the data, intellectual or commercial property, but also the allocation and/or its license. Check this box if you want to use the selection tools with this layer in the published map. Check this box if you want to use the export tool with this layer in the published map. Check this box if you want to use the zoom tools with this filter layer in the published map. Check this box if you want to use the search engine with this layer in the published map. 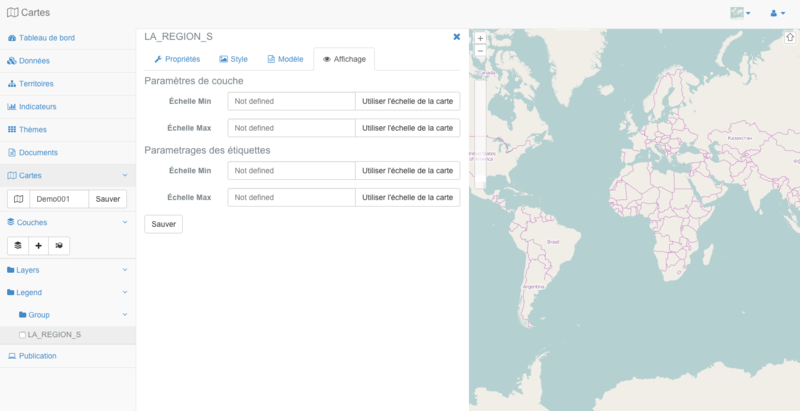 Click this box if you want to use the tools of analysis and spatial query with this layer in the published map. The Setup tab of the table display to define how the data will appear in the published application when the user will use a data selection tool. The settings are made using the form provided below. It displays each column of the table as a line and allows you to define several parameters of table display in the published application. If you click on the icon to the left of the line number, you hold the button on your mouse and you move the mouse cursor up and down or basic top, you can define the display order of columns. the width (in pixels) of the column in the table with the column of field “width”. If you view the table at the same time as setting panel of the table display and attribute table, you can set the table directly then resizing tool to define its gains in relation to the display you want. The table display area in the card management module is much smaller than that used in the published application. Thank you to consider sufficient sizes for your columns, even if they do not appear completely in this module. The content of the configuration tab style and options vary depending on the type layer. The style of the film and the icon used in the final card when issued. The style parameters match the properties CLASS, and STYLE SYMBOL mapfile of MapServer . See the reference documentation<http://mapserver.org/mapfile/index.html>`__ for more information. The possible settings are listed in the table below and detailed in the respective subsections. We illustrate our point with the example of setting the style of a type of vector layer polygon , setting a type layer line is comparable. Move the slider button to set the transparency of the layer. This value in% defines the transparency of the layer in the final map (i.e in the map file). Select one of legend types available using the drop-down list for this purpose. If you use a different type of legend “Single Symbol”, you will have the opportunity to individually edit each generated classes. To do this, simply click on the corresponding line to the class you want to change. Inside a class, all features are drawn with the same symbol and / or the same fill color and border. In the case of a graduated **symbols ** ** type of classification or continuous color ** it is possible to use a method of quantification of data. R statistics booksellers is implemented to perform such classifications. The types of classification graduated symbols ** and continuous color ** can be used with integer fields or flotants numbers. They should not be used with a field of type character string for example. In the case of a type of classification ** ** graduated symbols, the values of the variable are grouped into a number of classes ordered by the field value used to perform the classification. n the case of a type of classification **color continuous ** , quantitative values of the variable are grouped into a number of classes and a color gradient and used to assign a color to a generated class. n the case of a type of classification **time series ** , the three types of classification previously defined can be used in an “stages” corresponding to different classifications that you define (for each step created). You can select or add a step using the drop down list provided for this purpose. The classification should then be set for each of the added steps. Each step has a legend is his own. In the published application, the layer will appear with a legend whose legend and display on the map varies over time. The use of a time series type classification generates adding interactive temporal frieze in the final map for moving from one stage to another. After all filled settings, click the “Sort” button. This entails defining classes and displays the résulat in the table of classes just below the pressed boutton. Each class can then be changed manually by clicking on the corresponding line in the table of classes. This causes the display of the editing of a class form, shown below. 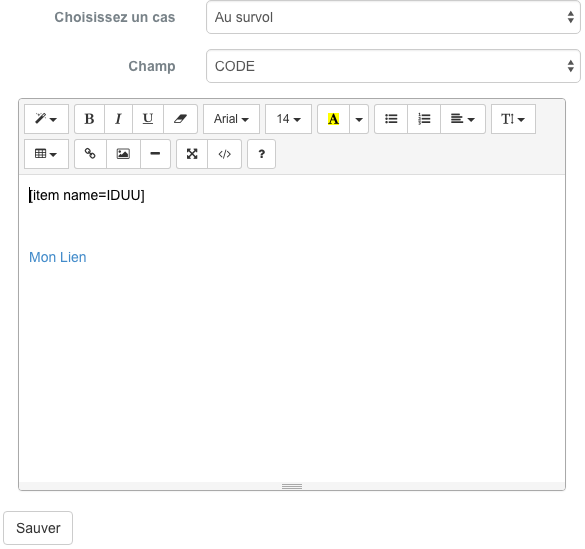 The text field specifies the name of the class, the class name is displayed in the published application, it is important to assign a relevant value. You can also use the filter to the classification level setting if you want to filter data to classify. A hatched frame (setting of the angle, size and thickness of hatching). Once all the parameters filled in, click the “Apply” button. The icon of the legend is instantly generated and displayed at the bottom of the window. The same parameters as for the layers of polygons or lines are provided, except for the choice of the symbol ** and ** size which are parameters spécifiquex style points. filling options with a symbol or a hatched frame are not supported for point layers. You can view the label or not for a given layer using the form provided below. By checking the box you can enable the display of labels, you deactivate the clearing posting. The field used to create the label, it is the value that will be displayed on the layer entity on the map. The text displayed on entity may be oriented at an angel or manually defined, by ticking the box by using the value in a field in the table that you can select in the list provided for this purpose. The text field to define the size of a buffer zone around a label displayed to ensure that no other tag will be displayed in this area. 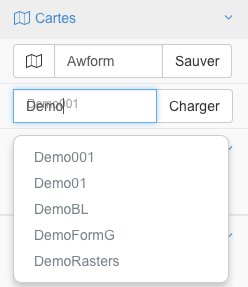 3 drop-down lists allow you to define the font to use, the font size and color. This check box enables (or not) the creation of a buffer zone bordering the label text. This often provides a better rendering of labels. You can set the size and color of the area. 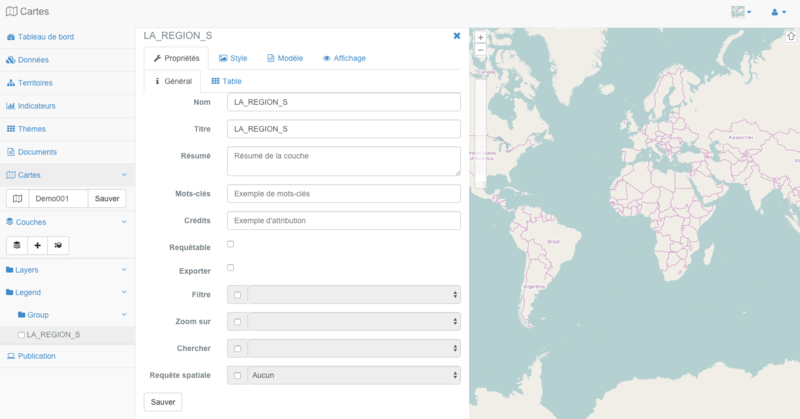 The position allows to define where the label to be displayed in relation to the geographical entity to which it corresponds. After the setup, you must click on the button “Apply” to save your changes, the display layer is then refreshed. The gauge of a layer corresponds to the model used in the tool tip or overflight window or click on an entity of a layer in the published map. The bubbles of information and therefore the templates are to be used only on vector layers. To configure the template of a layer, you must use the form provided below. “On click” (The template is displayed in an information window to click on an entity of the layer. 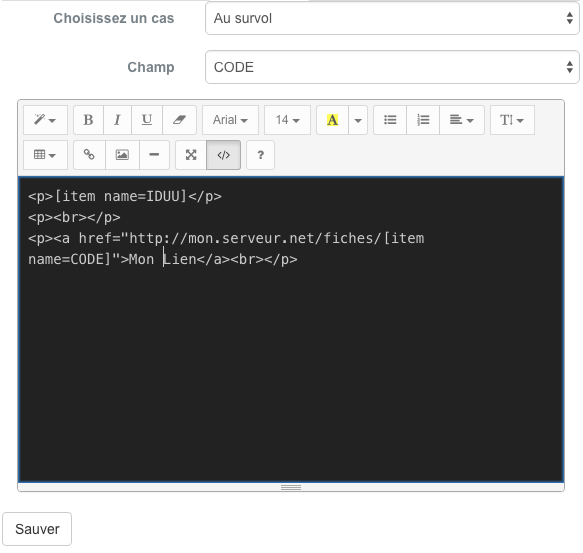 The second drop-down list for its fields present in the attribute table of the layer. 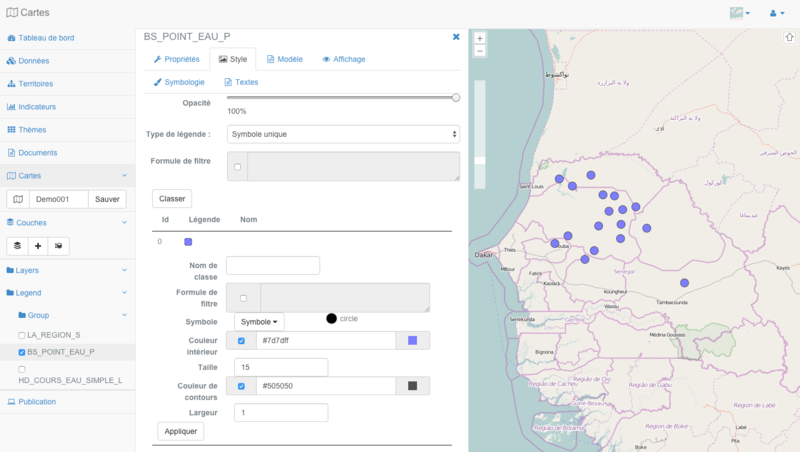 The selection of one of the field names causes the writing of the chain, allowing a dynamic replacement with the value of the field for the entity Laquel the corresponding user selected in the editing area of ​​the template below. You have great freedom in writing the template and you can easily query fields in the attribute table. Once your prepared template, click on the “Save” button to save the changes. The success of the registration stipulated in a green band at the top of the screen. The setting scales displays a layer is made using the form provided below. To remove a layer of the card as the tree, click the right mouse button button on the layer name and click “Delete” from the popup menu.